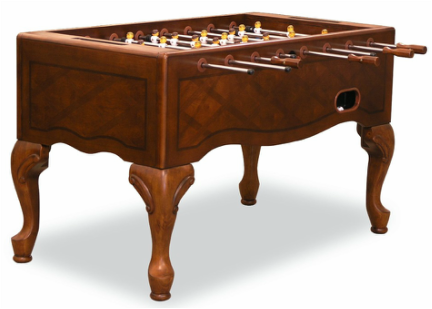 This model is manufactured by the Fairview Game Rooms company and they have made a version that is intended to blend in with your game room furniture. It comes with the optional Chestnut or darker Mahogany wood finish to provide a classy look to the outside cabinet along with Queen Anne styled legs. The sliding scoring units at both ends of the table are set into the cabinet to give the table a sleek look. This table lacks the modern style men with a pointed toe design and adjustable leg levelers. If you are interested in look over performance, this is likely the right table for you. This table is priced at about $1,050 US.